Many things in Triflora are like the World Up Top but many other things are quite different. I will take you for a bit of a look around. Not long after that, the Night cools down and I fall asleep. Over at Stone Mountain,you can see the Stone Men. There are just the four of them. Every day they try to walk barefooted from the bottom to the top of Stone Mountain. 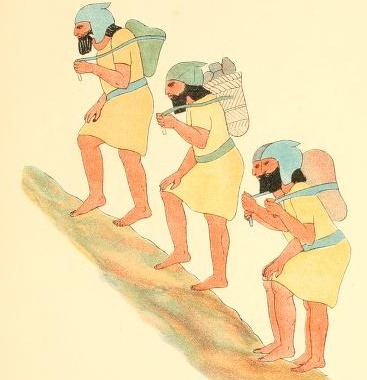 One their backs, they carry big bags of STONES. Heavy loads of Stone. Every single day, they do the same thing and they have never once made it to the top. Stone Mountain is not an easy Mountain – at all. Its no use asking them what they’re doing because they will not answer you. Very Unusual indeed. 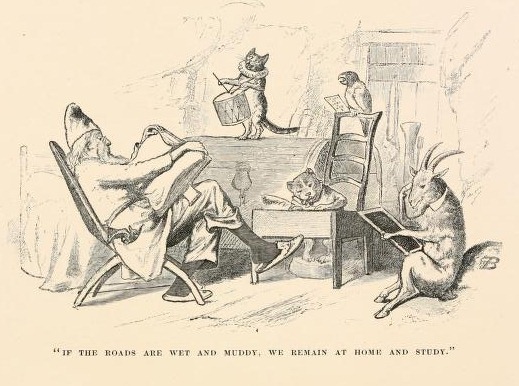 Now, these fellows don’t look too strange but they really are. They Cackle. One starts to cackle and then the next one joins in. Before long they are all cackling. Nobody knows what they are cackling about. Noone knows what makes them start and noone knows how to make them stop. Children run about all over the place in Triflora. We have a lot of Little Ones as well, who have come here in very strange ways and many of them don’t have family with them. That’s where the Yaks come in. If you see a Yak in Triflora, you can be sure that there is a Child somewhere nearby and if you see a child who looks as if they are alone, you can be sure that a Yak will be watching them and making sure that they are safe. 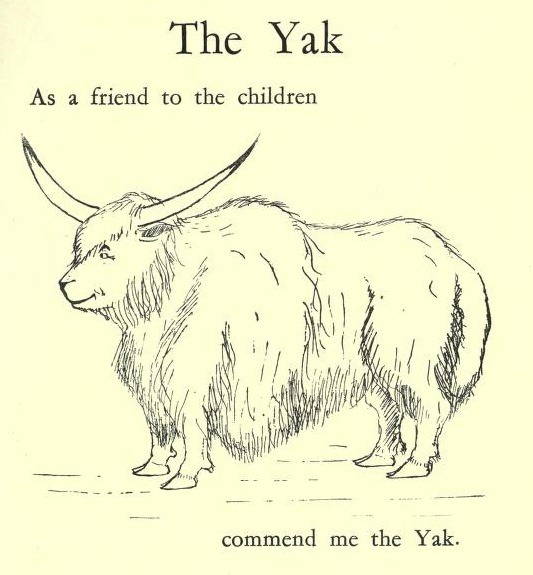 The Yaks are VERY good friends to the Children. It is a strange friendship, the Yaks and the Children. Take a look at Nettle-Anne. 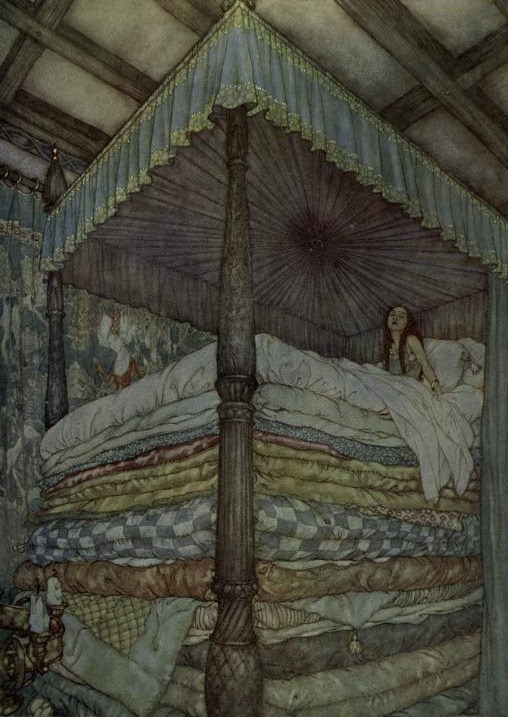 Noone complains about bedtime like Nettle-Anne. She is good enough in the daytime. She will eat whatever she is given and she doesn’t fuss over her clothes or shoes. But when it comes to BED, Nettle-Anne is strange and difficult – all at once. She will not sleep unless she has at least 19 mattresses and even then she will start yelling. Nana has just about had enough of Nettle-Anne! She doesn’t care how unusual Nettle is. She says Nettle is just a pain. “I’ll give her a pea in her bed!” says Nana. I’m not sure what she means by that and I don’t want to think about it. One of Nana’s very best friends is the Old Woman of the Mountain. She lives on top of Stone Mountain. Nana flies up now and then for a visit and they let the Winds of Chill blow through them. The Old Woman of Stone Mountain goes by the name of Nana Cold Rock or N.C.R. She fancies herself as a hard old woman and most people think she is but Nana and her are perfectly good friends. They were girls together in the Long Ago. N.C.R. doesn’t often come down from Stone Mountain. She likes it up there. 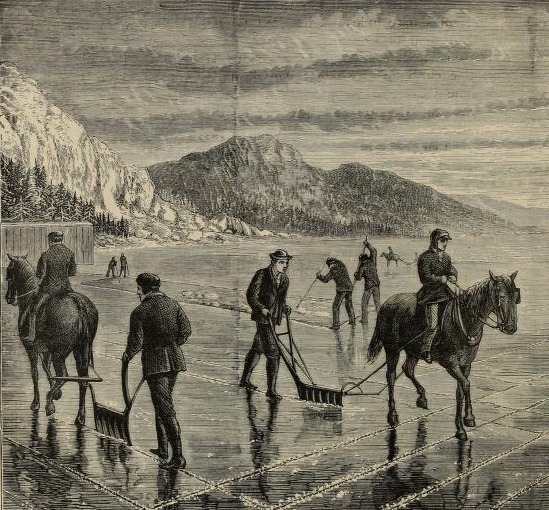 Stone Mountain was once a Volcano – so they say. They say that palm trees grew on it and waterfalls ran down the sides and noone who lived there needed clothes because it was such a warm and peaceful place. That was way Long Ago. It’s a pretty tough mountain these days – ever since it blew its stack once too often and became EXTINCT. N.C.R. is the only person who actually lives outside and on top of the Mountain. She loves her cabin on the summit and she does have a Lake right at her front door and the Lake is filled with bubbling hot water from the fires deep inside Stone Mountain. Abner lives inside Stone Mountain. He has a very cosy setup. The hot steam goes right up the centre of the mountain and warms the rooms and caves on its way up. Abner has his rooms just underneath N.C.R.’s Cabin. He has hot water from a tap and pipe in the lake and is generally very comfortable. Abner has never been seen wearing real shoes. He wears Slippers. You can do that when life is very comfortable indeed. Deep in Stone Mountain, live the Goblins. Goblins can be quite pleasant. Goblins can be downright horrible. N.C.R does have some trouble with the Goblins. Mad Barnie is particularly troublesome. The only good thing about Mad Barnie and Thomas his Toad, is that they don’t pretend to be pleasant. One look into their eyes and you KNOW you have Nutters in your hands. 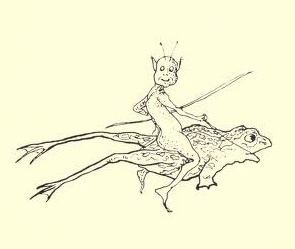 The trick part is that there are other Goblins riding on toads and they all look pretty much the same. I wouldn’t go into Stone Mountain by myself, if I were you. Its not the easiest Mountain in Triflora. Nana Cold Rock did have a little girl who lived in her Cabin with her. Her name was Bonny. She swam in the hot Lake and ran up and down all the tunnels and caves in Stone Mo0untain. Not one Being ever tried to hurt her or even scare her. They all loved Bonny and she loved them. She is living down near Poppy in the Village now but she comes home each week to visit Nana Cold Rock and all the beings of the Mountain. She almost always has a swim in the Lake as well. 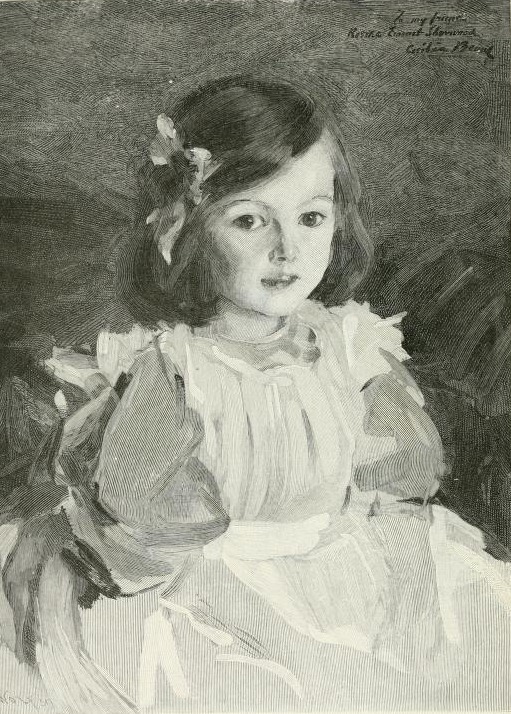 Bonny was the only Little Girl who lived in Stone Mountain. One day, N.C.R. who was quite a young Mumma at the time, took her down to the Dwarves’ Caves. Bonny was STUNNED. 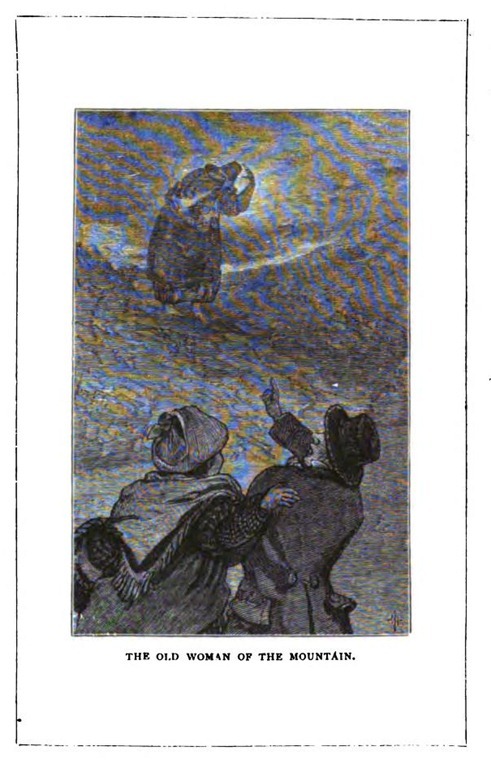 The Dwarves had been hammering and banging and singing while they worked for days. Bonny didn’t know what they had been doing. When she went down with N.C.R. to their caves, she found out! The Dwarves had carved an alphabet for her out of beautiful, coloured rocks. All the way from A-Z. The letters were big enough for her to play in and climb through. When she moved they followed her When she stopped, they stopped. When she pressed one with her finger, it spoke. 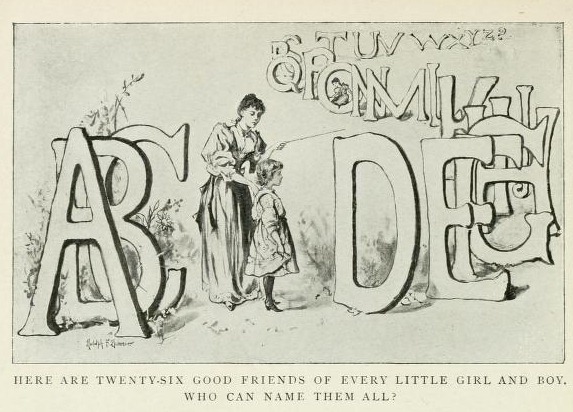 If she pressed the A it said – a.
Bonny didn’t have any other children as friends but she DID have 26 letters of the Alphabet and some spare ones for when she needed them. She could make words. She could write songs. The Dwarves called in the Wizards for Magic to make the letters strong enough to take any kind of a pounding but light enough for Bonny to move around. ONLY BONNY. Noone else could move them at all. 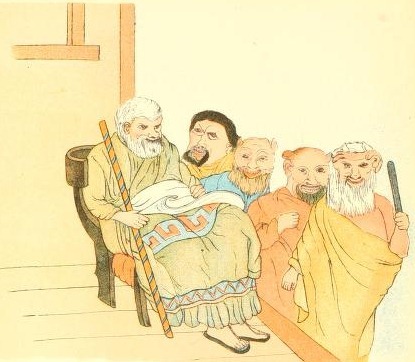 The Wizards sent Mad O’Brian over to see what he could do and it turned out he could do very well. It’s a very good thing to have Dwarves as friends. Bonny lives in the Village with Clarice. They met in Stone Mountain a long time ago now. Bonny was way down near the Goblins’ Caves with all of her letters following behind. A B C D E F G H I J K L M N O P Q R S T U V W X Y and Z. Next thing a blue cloak flashed past her and flowing blonde hair curled into the corridor. Bonny hadn’t seen a colourful sight like that down near the Goblins before and she took off after it. All the letters zoomed along behind her. It didn’t take long to catch up to the patch of Blue. 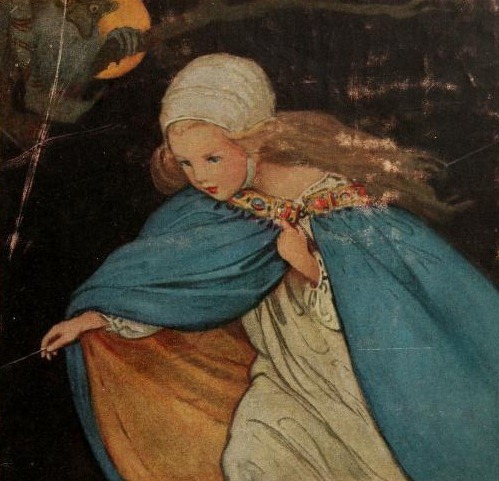 Inside it was another little girl with blonde hair and blue eyes and a white night dress on. And that’s how Clarice and Bonny met. Running through Stone Mountain with 26 Letters following close behind. They have the Library in the Village now but back then it was just two little girls. Clarice had woken up in the middle of the night and seen Mad Barnie and Thomas the Toad at her window. Instead of going back to sleep or telling someone about them – she had followed them. Goblins have that effect on young girls at times. 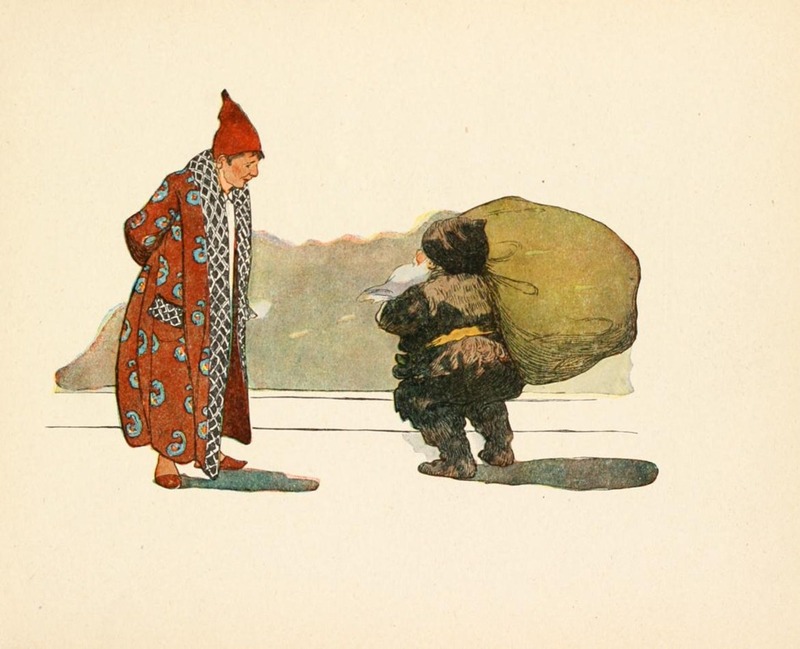 Clarice wrapped her Blue Cloak around her and with no shoes on at all, she rushed after the Goblin and the Toad. She didn’t stop to think. She didn’t even think while she was chasing. “Not thinking” is a good way to get into a mess and before long she was in a BIG mess. Goblins are terrible teasers and Mad Barnie kept just in front of Clarice until she was inside Stone Mountain and deep down in the Goblin Caves. She has never told anyone about what happened down there and she says that she never will tell anyone.